Newton, MA, a hotspot for college students and professors alike, has grown to be a valuable part of the Boston metropolitan area. Newton is also where many families and young couples build their lives. Given the age of Newton, many homes are ready for a siding upgrade. Local siding contractors like ourselves that provide great quality work are harder to come by. 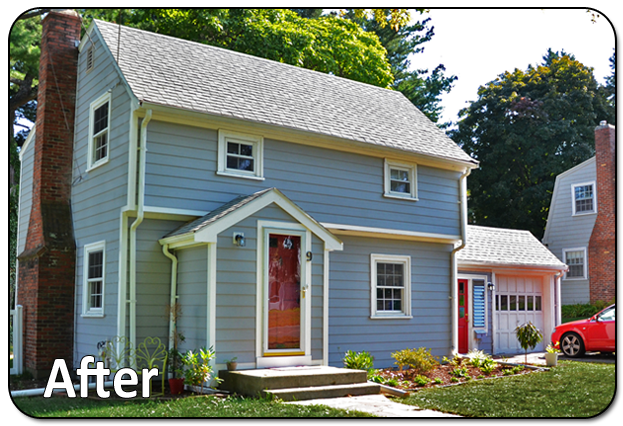 After lots of researching, these local homeowners made the call that would set them on the path of replacing the siding on their home while adding aesthetic and resale value. In this situation many start by considering vinyl siding on their home because they want the lowest possible maintenance, but at the same time they want something durable, beautiful, and realistic looking. This homeowner was introduced to Everlast Composite siding and they easily agreed that Everlast is far superior than all kinds of vinyl siding. They soon decided that our Seaside Gray, 7-inch Everlast clapboard was the right choice for this investment in their home. 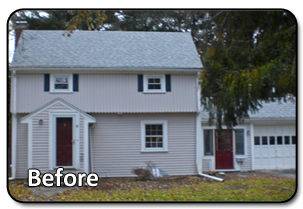 We removed all existing wood siding and used Everwrap for the moisture barrier and fastened the Everlast clapboard with stainless steel, ringshanked siding nails. We also replaced the cornerboards with 4-inch SuperCorner and used white cellular PVC for the door frame. I would say that this project was a great 180 turnaround and the family that owns this home is extremely happy with the end results!